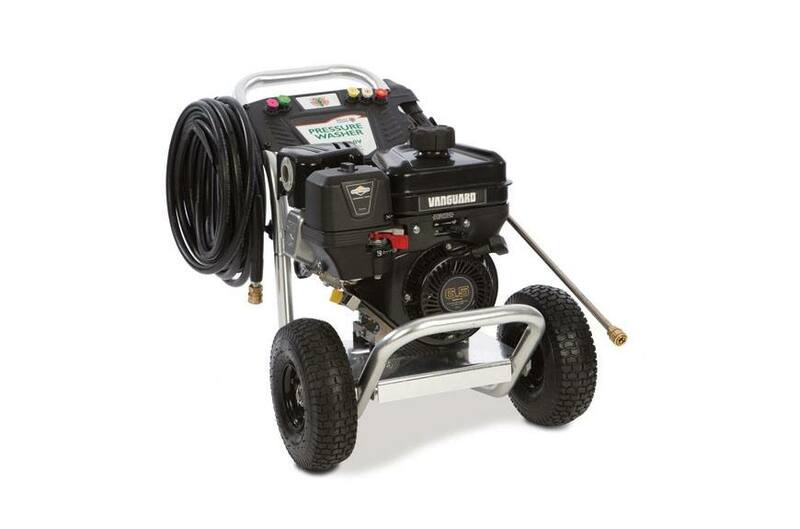 Billy Goat's new PW25A0V 2,500 PSI pressure washer offers big clean-up power in a small package. Ideal for deck, sidewalk, garage floors and fence cleaning— getting the job done faster with extra power and rugged construction. The unit features an Annovi Reverberi™ triplex pump powered by a 205 cc Vanguard engine with Transport Guard™, designed to eliminate the harmful effects of oil/fuel dilution during transportation. The light weight corrosion resistant aluminum frame makes it easy to maneuver and it has a 2.5 gal./ min. capacity. Available for delivery March, 2017. Light-Weight Corrosion Resistant Aluminum Frame: Aluminum bumper and base. Maneuvers with ease. Onboard Rubber Hose: Standard. With steel wire reinforcement. 50', 4,000 psi max. Replacement Part No. 80012618. Spray Gun & Wand: Both standard. Trigger with safety lock-off. Part No. 80016529. Wand is 20" length, stainless steel. Replacement Part No. 80013797. Quick Connect Nozzles: Pre-defined spray patterns for precise control. 0, 15, 25, 40-degrees & Soap. Standard. Replacement Part No. 210600.